Vitamin D3 5000IU 180 caps. Take one capsule a day after a high-fat meal. Taking preparations with vitamin D is usually recommended in autumn and winter, when the skin is much less exposed to sunlight. However, supplementation can be continued throughout the year, particularly if you do not spend time in the sun between 11a.m. and 2p.m., when UV-B rays, necessary to produce vitamin D in the skin, are the most active. The best idea is adjusting the dosage to blood test results. 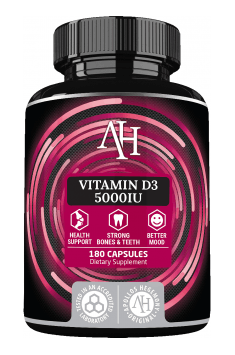 Many people take even 10,000IU of vitamin D when the deficiency is serious, and in the case of smaller deficiencies, 5,000IU should be enough. As a fat-soluble vitamin, it should be taken with a meal containing a source of fat for better absorption.